Craig McGarry is Gaia Retreat & Spa’s head Personal Trainer & Wellness Coach. 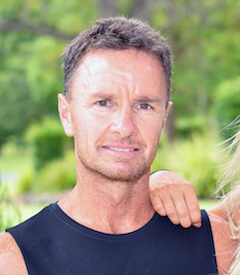 He displays an impressive wealth of in-depth knowledge as one of Australia’s most experienced coaches with over 25 years of Fitness Training experience. His expertise ranges from world class athlete coaching to integrative functional fitness & movement practices combining breath work and tai chi, further expanding into exercise rehabilitation work. Each Gaia fitness and wellness program with Craig is guided by highly effective protocols through the integration of modern fitness training with the time-tested techniques of focusing on breath, purposeful movement, mindfulness and meditation. Craig has the experience and motivation to maximize your stay at Gaia whilst creating very personalized routines that can easily be integrated into your daily life.